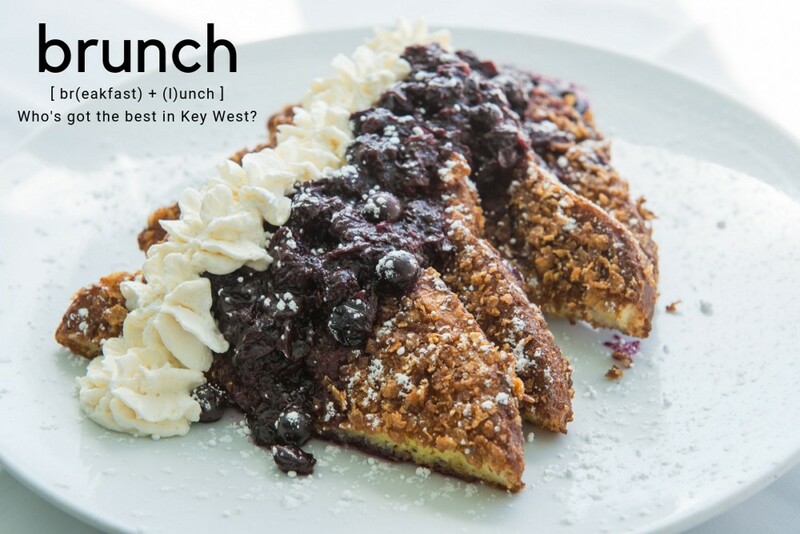 You're on vacation so sleep in, explore the island and eat and drink at some of the top restaurants in Key West - Let's go brunch hopping and learn about the very best brunches in Key West. We know it's one of the most frequently asked questions so here's the answer and four restaurants serving up the best brunch in paradise. Our first stop is at the beautiful Hot Tin Roof restaurant overlooking the Sunset Pier at the end of Mallory Square. It's a favorite amongst locals and tourists alike, and it's not just because of the scenic views. The brunch is $49 per person and has an incredible bloody mary station unlimited mimosas and 30 delectable brunch menu items. When you arrive, you are not only greeted by the hostess, but you are welcomed with the best build your own Bloody Mary bar on the island. 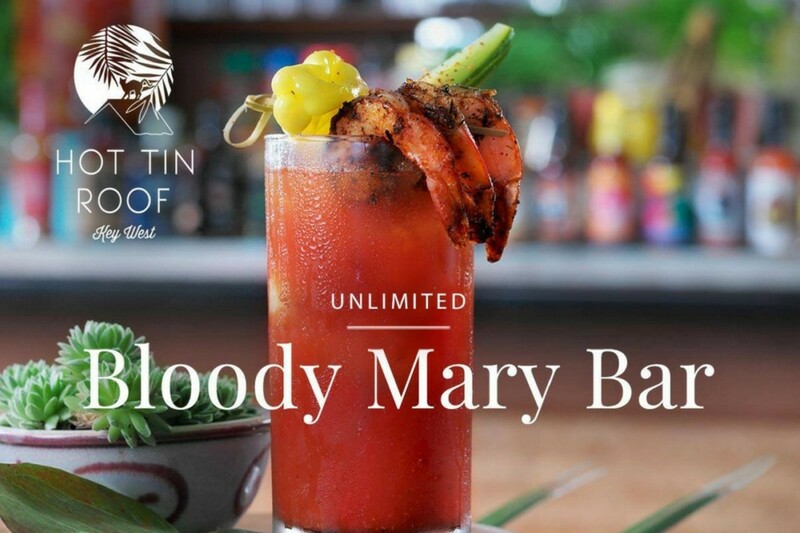 You'll also be happy to know Hot Tin Roof Sunday Brunch also offers unlimited Mimosas and Bloody Mary's! "Amazing! Best Bloody Mary's! Loved this place! Incredible all-you-can-eat upscale brunch served on small plates. Go hungry. You'll want to try everything. And everything is fantastic. The most extensive Bloody Mary bar we have ever seen AND they were the best in Key West by far. Would highly recommend." ~ Lisa R., Linwood NJ via TripAdvisor. On the Menu: Fried Chicken and Waffles and the Shrimp and Grits. You can't go wrong with any of the items listed on the menu, but those two are getting rave reviews from all who visit. Good to Know: Brunch served from 11:30 am to 2:30 pm on Sunday. The last seating is at 12:45 pm. Reservations recommended. 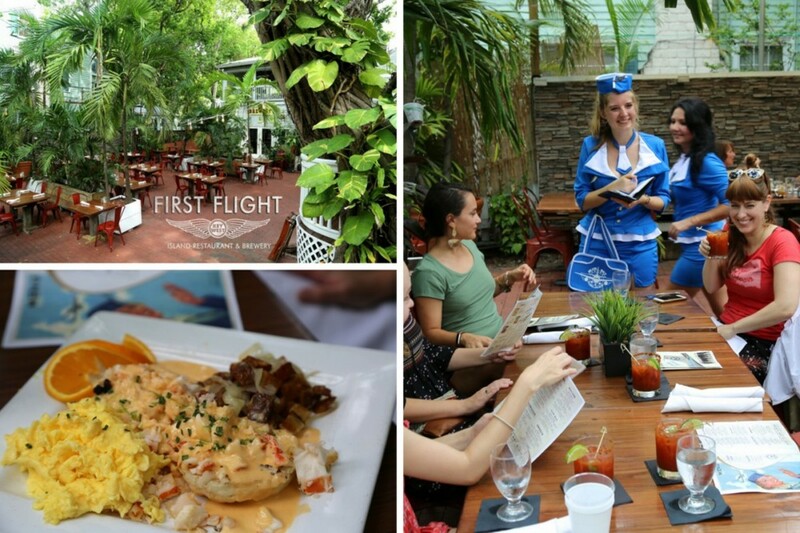 Brunching in Key West just hit top flight at First Flight as the restaurant is serving Sunday Brunch from 10 am - 2 pm. Located at the corner of Caroline and Whitehead Streets in the heart of Old Town and housed in the original office of Pan Am, is where you'll find First Flight Island Restaurant & Brewery, also the southernmost brewery in the U.S. Sharing a little bit of Key West history before we talk about the fantastic brunch. Good to Know: Ask your server to upgrade you to First Class Dining ~ $35 bottomless stewardess cocktails and unlimited small plate menu. YES, this is worth the upgrade! Brunch Vibes and Brunch All Day at Bagatelle! Let's start with a little bit of history. "Built in 1884… this beautiful mansion was a private home for 100 years before it became one of the most remarkable restaurants in Florida." It's one of our favorite restaurants located on the world famous Duval Street. If you can’t make the Sunday brunches, we’ve got great news for you! Bagatelle features a brunch menu seven days a week from 9 am – 4 pm. If you want to sleep in late, plan an action-packed morning on the water or spend time exploring paradise you can do it all and have the brunch experience any day of the week. Guests also get to enjoy a Key West dining experience on the world famous Duval Street and some of the best people watching along with cool cocktails, local cuisine and an award-winning wine list with well over 250 selections. "Best Brunch in Key West!!! Great atmosphere! Beautiful building! Great staff!" ~ Christopher Cory, Recommends Bagatelle Restaurant on Facebook. Let’s Eat! 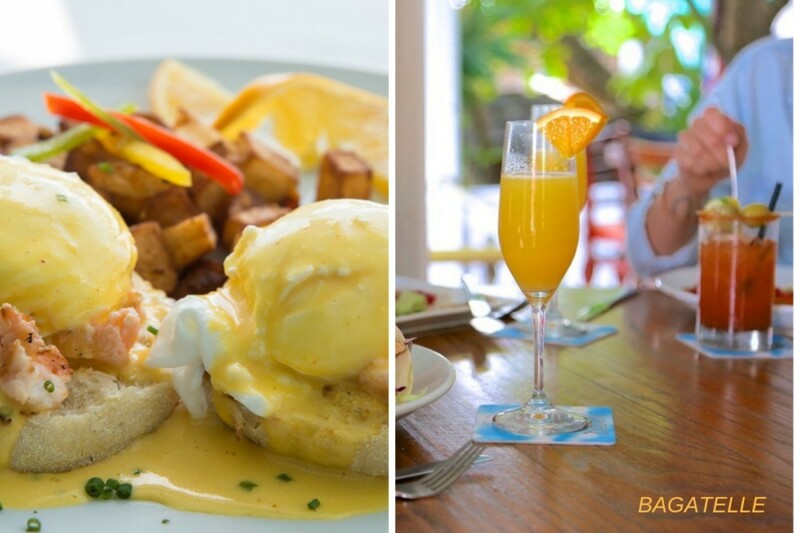 A few of our favorite brunch dishes at Bagatelle Restaurant are the Lobster Benedict, Surf & Turf Benedict, Biscuits and Gravy (a must try) and the Bananas Foster or the Crispy French Toast! Once again way too many to favorites. Visit and enjoy the Bagatelle Brunch experience and make sure to come back and tell us all about it. Next on our list of best brunches in Key West is the iconic Blue Heaven located in Bahama Village at the corner of Petronia and Thomas Streets. A locals favorite too. When you experience Blue Heaven, you experience Key West. The restaurant is colorful with an authentic Key West vibe all wrapped up in island style with canopies of tropical foliage, art, sails strung between trees to provide shade. The ambiance and eclectic menu along with excellent service are why people keep talking about it and coming back for more! It’s the perfect place to enjoy daily brunch from 8 am - 2 pm. Favorites on the menu include the Eggs Benedicts. 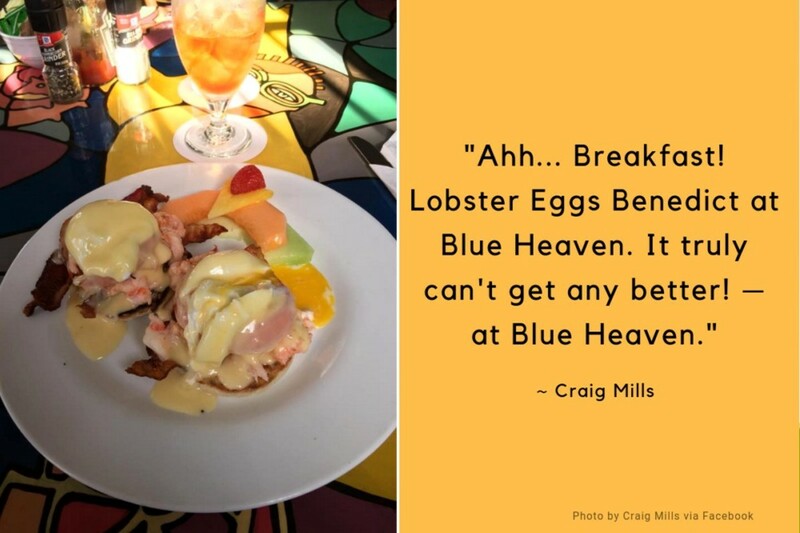 These are not just any eggs benedict; they are the Blue Heaven Benedicts -Vegetable Benedict, Ham Benedict, Sausage Benedict, Bacon Benedict, Beef Tenderloin Benedict or Key West Pink Shrimp. All served with poached eggs, english muffin with a lime hollandaise and if you want to jazz it up a bit add asparagus, tomato, spinach, avocado or bacon to your benny. Other favorites on the menu include the Shrimp and Grits where they sautee Key West Pinks in white wine, butter, and scallions and serve it over grits and white cheddar, served with a side of fresh toast or Betty’s homemade banana bread. Soooo good! "We enjoyed brunch outside in the courtyard with rooster on the loose and canopies of trees. Large meal portions will satisfy your appetite with a taste of mimosa or afternoon cocktails, live music relaxing! Best homemade banana bread I’ve tasted, bought one for the drive home." ~ 395tashab via TripAdvisor. Good to Know: This restaurant is popular, and you may have to wait for a table - know it is well worth it. There are cool shops and boutiques in the neighborhood to keep you busy while waiting for one of the best brunch experiences on the island. Brunch is served daily from 8 am - 2 pm. Parking is limited so walk, bike, take a cab or call an Uber. Rooster free dining is available inside. Live music daily during lunch and dinner.